Another record entry for the North of England Regional event with a total of 155 registered players of which 146 participated. WO55: Jill Campion came through a tough 5 setter in the semis against Hilary Kenyon and then backed that up in the final with a 3 game win over Lesley Sturgess. WO50: Andrea Santamaria was never really troubled in this age group where she is so strong. Helen Barnard did give a good account for herself in the final though, Andrea winning 3-0. WO45: Plenty of close matches in this event, which shows the depth of standard. Good to see Sarah Parr on the comeback trail following her surgery, reaching the semi-finals and taking a game off the number one seed - Sarah Spacey who made it to the final. In the bottom half, number 2 seed Rachel Calver was really made to work and just won a very close semi 13-11 in the 5th against Nikki Fowler and then recovered well to then beat Sarah Spacey in the final 3-1. WO35/40: A small group of 4 ladies played in a pool format. Some close matches with Natalie Townsend coming out as winner and Reka Gay as runner-up. MO75: A pool format of 5 players here with every match going the way of 3-0 weirdly! Anyway, the silver fox Adrian Wright won the age group to extend the many regional titles he holds, with William Wilson as runner-up. MO70: Number one seed Ian Ross from Scotland made it to the final relatively unscathed but met his match against the strong Barry Featherstone. Barry added to his massive collection of regional titles to win the final 3-1. MO65: Jim Dougal from Scotland was the giant killer in this age group as he beat number one seed John Goodrich in the quarters and then beat Geoff Walton in the semis. However, in the final he was up against Geoff Redfern who beat the number two seed himself and Geoff came through to win the final 3-0. MO60: The top seeds were tumbling in this age group too! Top seed Alan Barwise went out in the quarters against Colin Sheilds, only for him to then lose to regional newcomer Nick Gollaglee from Somerset. Number two seed Gordon McManus lost in the semis to Ian Bradburn 3-1. The final saw a clinical display of lobs and drops from Nick Gollaglee who was very brave to carry on playing after painfully rolling his ankle at the beginning of the third game. In fact, he not only recovered enough to carry on but even went on to beat Ian Bradburn 3-0 to become champion. MO55: Top seed Eamonn Price moved through to the final but not without an overly competitive 3-1 semi final win against David Box (not one for the faint hearted so I hear!). Number two seed Alex Betts showed his class in the bottom half and won all his matches 3-0, even against the strong John Parkes in the semis. However, it was the superior class of Eamonn Price that was telling in the final as Eamonn won comfortably 3-0. MO50: Simon Spencer took a couple of really good scalps in this age group by beating number two seed Andrew Cross 3-1 in the quarters and then winning 12-10 in the fifth against 3/4 seed Phil Yerby in the semis. However, the final was always going to be very tough against Yawar Abbas who didn't drop a game all tournament and won 3-0 to become champion. MO45: The semi-finals of this age group were heavily dominated by the locals, with 3 out of the 4 players being from Yorkshire. Matt Stephenson won through to the final against John Simpson 3-1 and top seed Jonathan Gliddon won his semi 3-0 against home Pontefract player Simon Gittins 3-0. In the final, Jonathan looked comfortable at 2-0 up, but the intensity swung for Matt to then dominate the next two games and take it to a fifth. In the final game, Gliddon rediscovered his level of intensity of the first two games and won 11-5 to end as champion. MO40: Super coach (and Dad) Ben Hutton was juggling back and forth to Manchester to fulfill his duties as support for his daughter in the junior tournament there. Ben took five games to beat Joss Hargrave 3-2 and another five-setter to also beat Tim Burrell 3-2 in the semis. In the bottom half, number two seed Mike Potter came through to the final but found Ben Hutton too much to handle, with Ben winning 3-0. MO35: The match of the tournament saw number two seed Alex Preston play Paul Stroud in the quarters, in an unbelievable match that swung back and forth. So much effort was put in by both players, with "court maintenance" having to enter the court to wipe the sweat off the floor after various dives to retrieve some great shots. In the end, after about 90 minutes, Alex Preston won 14-12 in the fifth game - leaving both players laying on the floor exhausted. Unbelievably, Alex was able to regroup and recover sufficiently to then beat Marcus Hayes 3-1 in the semis. In the top half of the draw, the evergreen Jamie Goodrich won his semi in five games against Ali Coker to reach the final. Alex Preston couldn't repeat his heroics in the final with Jamie Goodrich winning 3-1 to win his 20th regional title! Incidentally, all Jamie's wins have been in the Over 35 age group!!!!!! 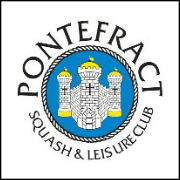 Thanks to Pontefract Squash and Leisure Club for their outstanding facilities. With special thanks to the catering and bar staff, Steve Ridge and Club owner Mick Todd who kindly presented the prizes to the finalists. Thanks also to the referees - Peter Berry and Peter Fielding who did a great job without any breaks! Biggest thanks once again to the amazingly professional tournament organisers/managers, without whom this wouldn't happen - Brian and Roz Brock.